We'd like to propose COMSA signature design bounty. 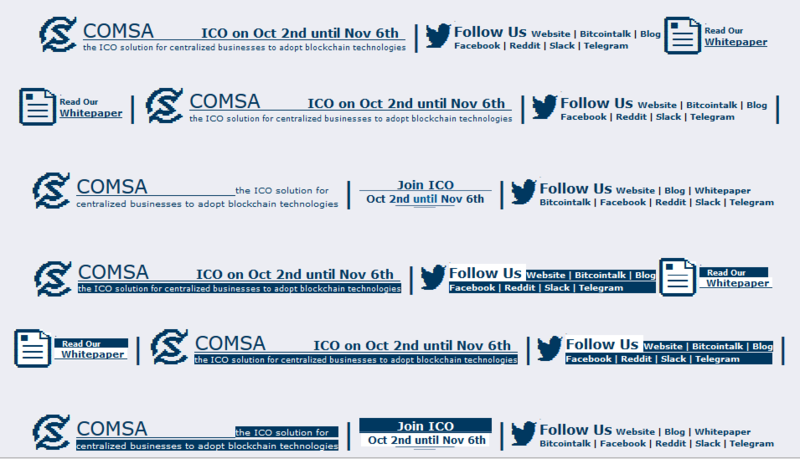 You need to provide design of COMSA signature for every type of bitcointalk account (junior, member, full member, senior member, hero/legendary) which makes 5 different designs/signatures. 5. Text art ver need to include our logo. We glad to see you here! people, give some ad in media. Working on it. Will post the design once finished. Still working on improving the colors but here's the preview. From Jr member to Hero/Legendary. We are waiting for ICO! Where can I read about the bounty? I couldn't fix logo size but I would post my entries. thanks. Updated the color blending on the Hero/Legendary and Sr. Member Signature. no probs. I edited my post. Btw, Signatures for each rank have restrictions and it should properly fit the signature space. Your design looks nice but it won't fit the signature space and it does not mean some of the restriction for full member and below. You can check a post in meta for guidelines. You are right. This is my first signature design and I mede them without any guidelines nor tutorials. I have a ton of things to learn still. For example, I couldn't fix logo size. It will be announced here soon.